Yet another imprint from Asia Books, and printed in Thailand this year, is Alex O’Brien’s Winter in Tibet (ISBN 974-8303-66-7). This is not a sequel to Sherpa Ten Sing’s life story, but rather it is an action thriller centered around an American lawyer, Justin Standell. The law, as a profession, seems to attract more than its fair share of thriller books; however, with the author being a lawyer, it makes for authoritative writing, if nothing else. This is also O’Brien’s second book, with Midnight in Burma being his first. Action is certainly the main game in this thriller, and by page four you have two dead bodies in a Hong Kong footpath. By page 32 you have another brace in a seedy club in Kunming, and you begin to wonder where all these tantalizing, but loose ends are taking you. One loose end takes you to the underworld of Macao, where yet another character makes his entrance, and almost his exit. By page 44 you are reeling. By page 50 the ‘good guys’ in Beijing, in the US mission there, are looking nervously at Tibet and suspecting duplicity in the interface between the DEA and State. Not a difficult leap of faith if you have had some experience in the battlefields of politics (and the movements behind the scenes)! One of the hardest parts in this kind of book, where so much hinges on another part, sometimes seemingly unconnected, is to keep all the balls in the air at one time, and Alex O’Brien has certainly produced a plot with plenty of balls, literal and metaphorical. The central character, Justin Standell, seems to have his hands full at all times, while taking the reader on a tour of the mystic orient, ending up in Tibet. In that foreign country, which has remained relatively closed for decades, one gets the feeling that anything can happen. In this book, anything does happen, from nomadic tribesmen with rifles, to Chinese quasi-businessmen with revolvers, to double agents with pistols, to a DEA undercover operative who is having an affair with an American female marine attached to the mission in Beijing. You can practically smell the gunfire. In the middle of all these, swept along against his will, is the young American lawyer who finally makes it, both career-wise and personally. If I were to be critical of this book, it would have to be the cover. It does not leap off the shelf and to have the drivel across the top of the cover that this book comes “from the land that inspired Hollywood blockbuster Seven Years in Tiber” is not inviting the would-be reader to go further. Something like “Intrigue and double-dealings as East meets West in an explosive thriller with an even more explosive ending” would be much more likely to invite attention, in my opinion, but then, perhaps I should stick to reviews rather than copywriting! Good book of its genre. I enjoyed it immensely, and the final reference to Justin Standell’s psychological make-up, which comes right at the end, is inspired. A great read for B. 450. Lynyrd Skynyrd is living proof that nothing stops Rock ‘n’ Roll, and that you cannot keep a good band down. Over the years the Skynyrd have suffered from bad management, disagreements, and wrong decisions, coupled all the way with personnel tragedy. When the band was on the crest of a wave in 1977, and probably the number one touring band in America, they suffered an infamous plane crash that took away the lives of lead singer Ronnie Van Zant, lead guitarist Steve Gaines, and backup singer Cassie Gaines, leaving the rest of the band with multiple injuries in hospital. Although Allen Collins recovered from paralysis enough to perform live on stage again, his life - as well - was taken from the band by an untimely car accident. Then, at the start of the recording of the album for this tour ‘Vicious Cycle’, the life of bassist Leon Wilkeson (the cat in the hat) was taken from the band in July of 2001. It says mountains about the present band members as they keep the Skynyrd Southern flag flying. 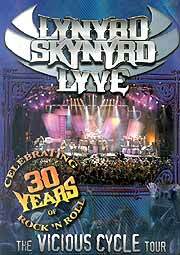 The band’s roots can be traced back to 1964, when a certain Ronnie Van Zant started singing lead vocals for guitarist Gary Rossington’s school band, but this DVD has been released in celebration of thirty years of recording under the Lynyrd Skynyrd banner, starting 1973 with their first album ‘Pronounced Leh-Nerd Skin-Nerd’ (named after the nickname of the boys’ high school gym teacher). It was not until then they started their meteoric rise to stardom. After the plane crash it took ten years before a band went out on the road under the Skynyrd moniker as a tribute to their fallen brothers. The tour was such a success that it was decided to keep the band permanent, and to tour and record further albums. At first the lineup was quite liquid, but over the last ten years or so it has stabilized to the present formation, which could wipe the floor live with any band that has ever trod the boards. Two original members are still there from the classic lineup. Gary Rossington, from the original three pronged guitar attack, one of the meanest slide guitarists on the planet; and Billy Powell, the only man who can really play that beautiful piano intro to Freebird. Joining them are Ronnie Van Zant’s brother, Johnny Van Zant on lead vocals; Rickey Medlocke on lead guitar, he used to front the magnificent ‘Blackfoot’; and completing the triple axe barrage is Hughie Thomasson (ex ‘The Outlaws’, perhaps one of the most underrated country/rock bands to come out of the south). Then replacing Leon Wilkeson on bass is Hughie Thomasson’s old band mate Ean Evans. Powering the band from behind the skins is Michael Cartellone. You have to be a very fit young drummer to keep up with these cats. Carol Chase and Dale Krantz Rossington add backing vocals, bringing the Lynyrd Skynyrd contingent up to nine. If they were not flying under the Skynyrd flag, they could truly be called the Southern Rock All Stars. For this special concert to be recorded for a live CD and DVD, they have also included a brass and string section to add more dynamics to the sound. But do not fret, you hardened Southern Rock fans, it takes none of the Skynyrd gruff vocals and roaring guitars out of the mix. In fact, this is the best I have ever seen or heard the band play, and that is from someone who saw the band twice in the mid Seventies. Neither is this just a run through of greatest hits from a bygone era. The newer songs are mingled in with the older classics, and believe me, you cannot hear the join. Off the new album ‘Vicious Cycle’ (2001) come two of the concert highlights. The song ‘Red, White, and Blue’ is the most patriotic song ever recorded. With its wonderfully emotional chorus of “My hair is going white, my neck has always been red, and my collar is still blue,” it certainly brings a lump to the throat. At the end of the set another ‘Vicious Cycle’ song, ‘The Way’, fits in perfectly between ‘Sweet Home Alabama’ and ‘Freebird’. Now you have to stand pretty tall to stand side by side with those two.